This fried rice with mixed vegetables include shrimp, peas, corns, carrot, soybean sprout, Chinese leek, tomato. I also used Guangzhou dried sausage to add flavor. 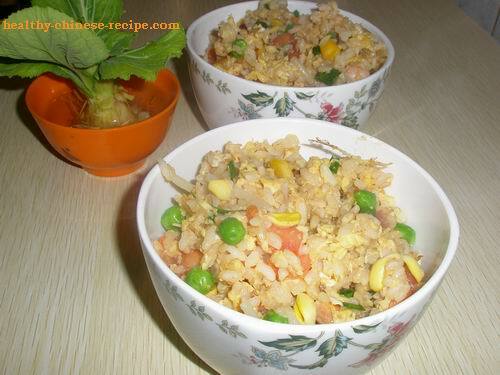 In restaurants fried rice doesn't contain many vegetables, but at home we can add as many as we like. 1. Clean shrimp, remove shell and vein. Cut into small sections. Marinate in Marinade Sauce. Crack the egg in bowl, beat well. Wash soybean sprout, boiled. Drain well. Clean Chinese leek, cut into about 1cm long section. Cut tomato into small cubes, same size of that of grains. 2. Chop onions and garlic. 3. Heat oil in a wok. Slip in egg, stir fry till solid. Add Guangzhou sausage, mixed beans, soybean sprout. Stir fry and mix well. 5. Add rice, stir fry evenly. Add salt. Stir fry 1 min. 6. Add Chinese leek and tomato cubes. Stir fry several times. 7. Turn off heat, serve in warm. Add tomato and leek last and don't cook them too long time. This will keep their flavor.